Hurricane Irma, upgraded to a powerful Category 4 storm, barrels towards the Caribbean and the southern United States with residents in its path preparing for the worst. 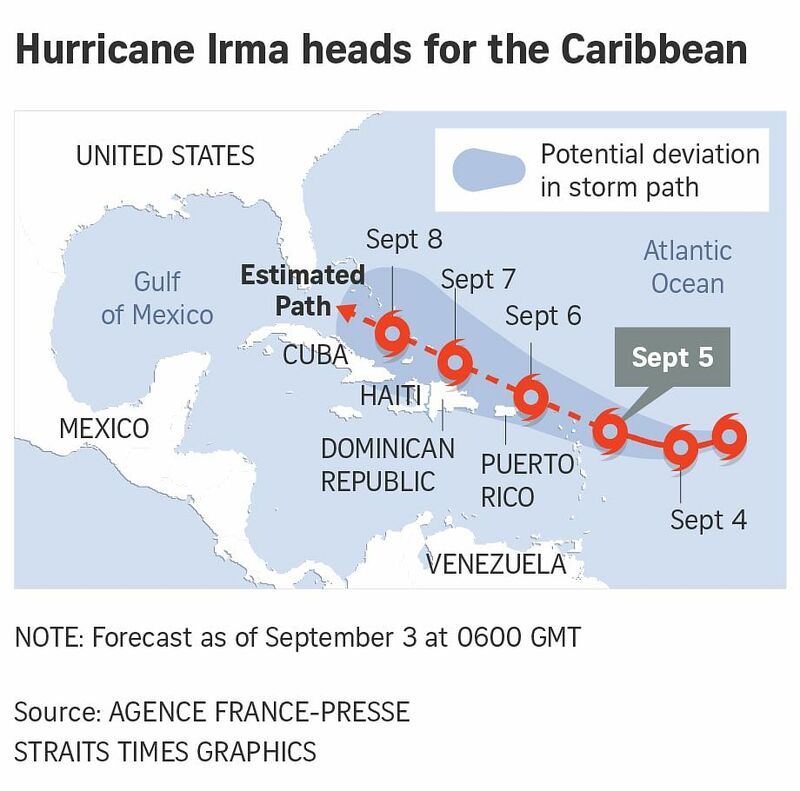 FLORIDA (REUTERS) - Hurricane Irma, a powerful Category four storm, plowed toward the Caribbean and the southern United States on Tuesday (Sept 5) as islands in its path braced for possible life-threatening winds, storm surges and flooding. Hurricane warnings and watches were in effect for territories that dot the West Indies, including parts of the Leeward Islands, the British and US Virgin Islands and Puerto Rico, in preparation for a storm that was intensifying with 220 kph winds, the U.S. National Hurricane Centre (NHC) said. A Category four hurricane on the five-step Saffir-Simpson scale means sustained winds of 209-251 kph with “catastrophic” outcomes, including uprooted trees and downed power lines, water and electricity outages, and significant property damage causing uninhabitable conditions, according to the Miami-based hurricane centre. In preparation for the storm, the government of economically struggling Puerto Rico declared a state of emergency and activated the National Guard on Monday. The US island territory, home to about 3.4 million people, has 456 emergency shelters prepared to house up to 62,100 people. Puerto Rico also activated a price freeze on basic necessities, including food and water, medicines, power generators and batteries, to help residents prepare. Telemundo TV station WIPR in Puerto Rico showed long lines of shoppers stocking up on bottled water, flashlights, batteries, generators, food and other items. The executive director of the state power authority, Ricardo Ramos, told the station that the power grid was so vulnerable from lack of investment that parts of the US territory could be without power for three to four months. “We’re preparing for the worst-case scenario,” he said. Irma also threatens the US East Coast and Florida, which declared a state of emergency on Monday night. The hurricane centre expects Irma to reach southern Florida on Saturday. The NHC cautioned that it was too early to forecast the storm’s exact path or what effects it might have on the continental United States, but warned of likely effects to hit some areas by later this week. “There is an increasing chance of seeing some impact from Irma in the Florida Peninsula and the Florida Keys later this week and this weekend. In addition, rough surf and dangerous marine conditions will begin to affect the south-eastern U.S. coast by later this week,” the centre said. Irma will be the second powerful hurricane to thrash the United States and its territories in as many weeks. Residents of Texas and Louisiana are still reeling from the catastrophic effects of the deadly Hurricane Harvey, which struck Texas as a Category four hurricane on Aug 25 and dumped several feet of rain, destroying thousands of homes and businesses.